Rick Perry, who has pulled ahead of Mitt Romney in the national polls, had to show whether he could hold his own in last night’s presidential debate at the Reagan Library in Simi Valley, California; and he did so. 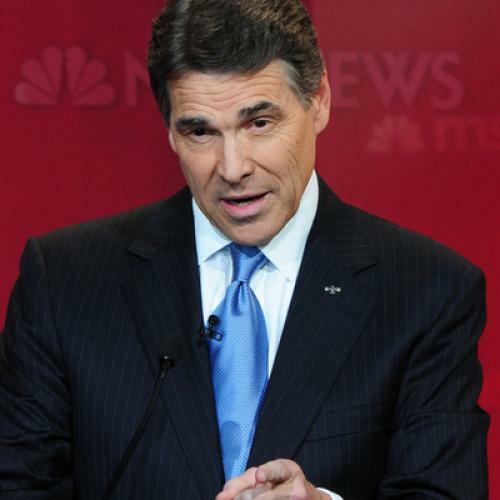 Romney began to develop an avenue of attack against Perry, but I don’t think it is going to be effective. The main thing in debates is not so much what you say, but how you say it. It’s a matter of attitude. Perry appeared tough, confident, able to deflect criticism, and to fire back when fired upon—whether over jobs in Texas, or his support for vaccination. When faced with a difficult question, his strategy was to reassert his position on “gettin’ America workin’ again.” He dealt gingerly with questions about social security and climate change, but his statements on these subjects are not going to get him in trouble with a Republican primary and caucus electorate that could cheer lustily when it was announced that during Perry’s governorship, Texas had executed 234 people. On social security, he avoided affirming the position he took in Fed Up against the program itself. And he made the ritual assurance that whatever he might do would not affect those on or about to be on the program. He might have to ditch his rhetoric about a “ponzi scheme” if he gets the nomination, but he might be able to get away with saying that the program needs to be reformed for the sake of the young. After all, George W. Bush won a general election in 2004 taking a position like that. Romney is the Nelson Rockefeller of today’s Republican party. Rockefeller, elected four times as governor of New York, was one of the most able politicians in America, but he was too liberal for the Republican party of his time. He backed civil rights and the welfare state, he was a big spender, he was pro-union. And he was also divorced. He might have won the presidency in 1960 or 1968, but he could never win the Republican nomination for president. Romney was raised in Michigan, not Utah; he learned economics at Harvard Business School; he made his mark as a businessman and governor in liberal Massachusetts. He has tried to recreate himself as a conservative Republican, but it simply has not worked. He could be the candidate by default against someone like Michele Bachmann, because most of the Republican electorate does understand that she is unelectable, but someone like Perry takes all the air out of his candidacy. That reaction says it all. Romney’s other ploy was to attack Perry on social security. Even while the debate was going on, I was getting an email from the Romney press operation titled “Perry does not believe social security should exist,” and listing quotes from him to that effect. Gerald Ford used that strategy in 1976 to win the nomination from Ronald Reagan, but I don’t think it’ll work today. Perry showed in Simi Valley that he is willing to back off from the position that he took in Fed Up. Of course, it’s just September, and other frontrunners have flamed out once the caucuses and primaries began. Rudy Giuliani comes to mind. But Giuliani was always a difficult fit for the GOP, especially in the South. Perry is not. And unless he says some really untoward things, or unless revelations appear that discredit him, I think the nomination is his to lose.